At what point in time do the American people wake from their XBox and iPhone induced slumber and realize that the bureaucratic masterminds in Washington, D.C. are the nightmares of our founding fathers vivified? It may not be too far off because even The New York Times is drawing attention to the fact that Hillary Clinton exclusively used — yes, exclusively — her personal email account to conduct all business as Secretary of State. Only a woman who believes herself to be exempt from the rules that govern the rest of us would exclusively use her personal email to conduct all official business as the Secretary of State. Most shady officials at least try to create a false veneer of transparency before finding ways to circumvent laws that inconvenience their plans — but not Hillary Clinton. Ask yourself this question: What would be the reaction if, under a Republican president, his Secretary of State exclusively used her personal email account to conduct all official business? Now ask yourself if that individual could realistically ever run for president. The answer is simple: she would be laughed out of the room. She would be disqualified. She would be an embarrassment to everyone who ever vouched for her integrity. A top adviser to Hillary Clinton’s campaign-in-waiting accused the George W. Bush administration of using private emails to skirt transparency rules in 2007. John Podesta, who left the White House in February for an unofficial role with Clinton, criticized Bush administration officials for using Republican National Committee email accounts for official business. “At the end of the day, it looks like they were trying to avoid the Records Act . . . by operating official business off the official systems,” Podesta said in an interview with The Wall Street Journal. Wrong, Mr. Merrill. The rules were crafted as an acknowledgement that politicians get boatloads of email every single day from a variety of sources, and that some of those emails might exist in a grey area where professional and personal life meet. Conducting zero business on an official government email account is not in accordance with the “spirit” of the law — it is anathema to the spirit of the law. “I want to have a much more transparent government and I think we now have the tools to make that happen. … For me, we’re now in an era which didn’t exist before, where you can have Instant access to information. I want to see my government be more transparent.” — Hillary Clinton on Meet the Press, 2008. If the American people elect Ms. Clinton president in 2016 — a woman who thinks she is above the rule of law — then they deserve all the consequences that follow. This makes me particularly angry because if you’re a nobody, like a volunteer for a non profit that receives some government funds, the gov has the right to seize your personal computer, email, and all your internet traffic, anytime it wants to if you so much as send a personal email to a fellow volunteer. We actually have to teach people this so they understand they have no rights to privacy in the event of an audit. It makes me absolutely crazy when the rules are enforced against the little people, but completely bypassed by the high and mighty. That’s why I don’t understand how so many people don’t get it — the bigger the government gets, the more stuff like this happens. Politicians always find ways to exempt themselves by the rules the everyone else must abide by, and even when they get caught breaking a law nothing ever happens. They’ll get a slap on the wrist at best. Your point about nonprofits is excellent! That’s a great example and I’m glad you brought it up. Speaking of which, how about Ms. Clinton’s foundation taking foreign donations while she was Secretary of State? Unreal. It’s not only arrogance, or a sophist belief that they’re above the law, it’s also downright incompetence. After all, we’re talking about someone who was not only the former First Lady and a U.S. Senator on the Armed Services Committee, she was also President Obama’s Secretary of State–which means Hillary Clinton, more than anyone else, should be aware of the potential risks to national security in exclusively using a public e-mail account. Let’s not forget we had a huge story last Christmas in which the so-called “Guardians of Peace” backed by North Korea were able to leak out all the private correspondence and personal details of employees and associates of Sony Entertainment Pictures by accessing their private servers. How many anecdotal stories can be people testify to about having someone access their credit card account and bank statements, or scam artists hacking into their personal computers? Hilary Clinton using a personal email account instead a more secure one that would have been issued to her the moment she was appointed (and the thing of it is, she had this email account even before she got the job) also means it would have been far more at risk for hackers. Marcel Lazar Lehel – Guccifer’s real name – breached the email account of Sidney Blumenthal, a former Bill Clinton aide who later joined Mrs. Clinton’s 2008 presidential campaign. Blumenthal had sent emails to her at the ‘clintonemails.com’ address, according to The Smoking Gun. Some of the messages Guccifer leaked online consisted of intelligence reports, sent in late 2012 to Clinton’s back-channel address, and covered matters in Libya – including the aftermath of the September 11, 2012 terror attack in Benghazi. So the irony here is that, in her apparent attempt hiding her correspondence from the official record, she ran an even greater risk of it being exposed than if she had just used the government assigned email address. It gets even worse, Mike. Check this out: She had her email filtered through her own server — in her house! 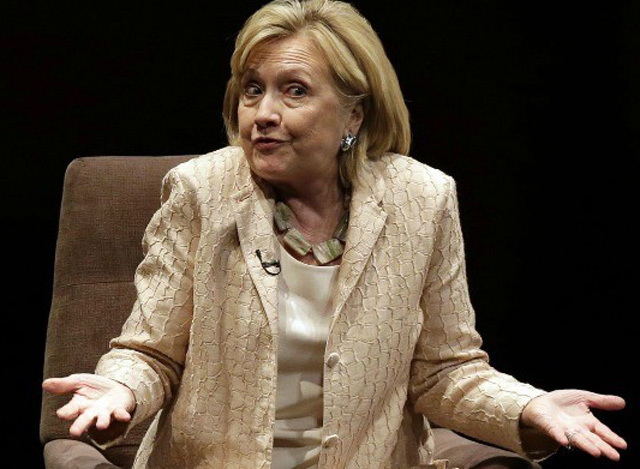 WASHINGTON (AP) – The computer server that transmitted and received Hillary Rodham Clinton’s emails – on a private account she used exclusively for official business when she was secretary of state — traced back to an Internet service registered to her family’s home in Chappaqua, New York, according to Internet records reviewed by The Associated Press. What the heck? You can’t make this up! So now the “spirit of the rules” includes getting your own email server that runs out of your house? How can any Democrat say this woman should be the president of the United States at this point? I don’t watch that program, but I agree with you that it sounds like something that should be a work of fiction. Sadly, it’s not.